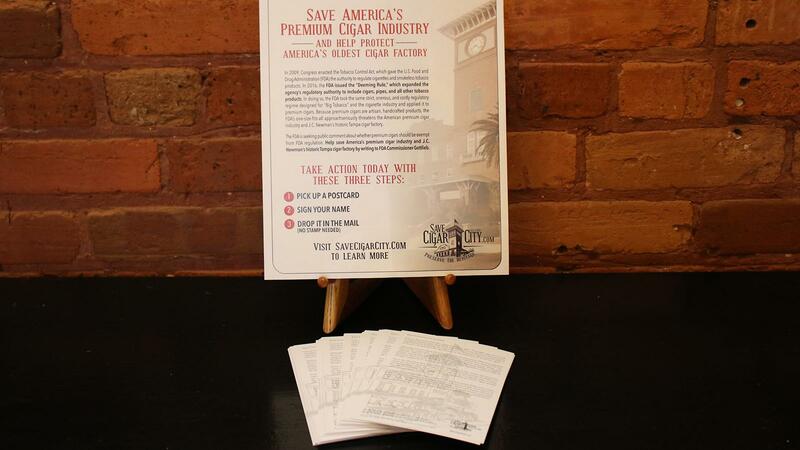 To help spread the word about its Save Cigar City campaign, the J.C. Newman Cigar Company has begun distributing FDA comment cards to brick-and-mortar tobacconists around the country. The postage-paid cards contain a plea to the U.S. Food and Drug Administration requesting the agency exempt premium cigars from stringent regulation. The FDA opened a commenting period in March after the agency announced it would reconsider its regulatory overhaul of the premium cigar industry. In response, J.C. Newman has printed 100,000 postcards that are pre-addressed to the FDA, so consumers have an easy way to voice their opinion before the commenting period ends on June 25. The comment cards are pre-addressed and the postage has been paid by J.C. Newman. All consumers have to do is sign their name and place the card in a mailbox. “As the FDA reconsiders the regulation of premium cigars, we wanted make it as easy as possible for cigar connoisseurs to share their comments with the FDA,” said company president Eric Newman in a press release. “It is critically important for our leaders in Washington to hear from adults across America who enjoy premium cigars." If you would prefer to submit a comment online, both Cigar Aficionado and Save Cigar City have posted sample letters and a link to the FDA’s comment portal on their respective websites.